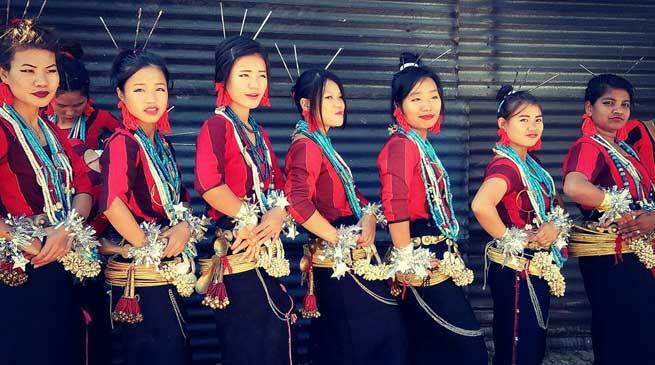 The popular festival of the Bo, Bokar and Ramo community celebrated their popular festival, Podi Barbi with traditional fanfare and gaiety at Gumin Kiin on Monday. Giving his Podi Bari greeting, Jarka Gamlin MLA Aalo East and Chairman APEDA said that festival and festivities represent watermark of our culture and gives us a distinct identity and expose our rich cultural heritage. He stressed on handing down such social responsibility to young generation so that they too take pride in it and maintain them. Responding to one point memorandum pertaining to construction of permanent Office and Dere for Podi Barbi Committee at Lik Putu, the MLA assured to do it in the financial year 2017-18. He also released a new audio album Nineh Geh Leyinga by the community. The Guest of Honour Karsen Lollen, Vice President GWS west Siang and Guest of Honour Shri Minjom Bagra Rtd. APCS said that all festivals are alike and stress on participation by all communities irrespective of cast and community barrier to expose richness of our tribal culture . Karsen Lollen also decided to donate one Mithun for celebration of Podi Barbi celebration in the coming year as taken of appreciation and encouragement.